Combining outdoor extreme sports with fundraising has become a norm for Tim Scott. Tim was diagnosed with ocular melanoma in 2012 during a routine eye exam by his optometrist. After treatment and hours of research about the disease, Tim decided he wasn't the kind of person who could sit on the sidelines. So Tim began raising funds for OM research using the extreme sport of Speedgolf. The Ultra Speedgolf fundraisers are events where participants play as many holes as possible in 12 hours. Players have played anywhere from 100 to 230 holes in that time covering up to 60 miles! Think of it as running almost three marathons with lots of golf in between. Tim (with his wife Lori) has helped raise $90,000 over three years at the annual Swing for Sight held in beautiful Napa Valley. In 2015, Tim received a second cancer diagnosis. This time it was lymphoma. After an intensive chemo regimen, he decided to focus his energy on another fundraiser. When contemplating which cancer to raise funds for, the answer was easy. "Ocular Melanoma is so rare," he explained. "This disease doesn't have a spokesperson or a national fundraising campaign. This is where I can do the most good." So, this spring, Tim plans to draw awareness to OM and raise research funds by running the Mount Diablo 50K in northern California. When asked about the difference between Speedgolf and this new challenge, Tim responded, "Running on a golf course is relatively flat. The big challenge with this race is going to be the hills." Indeed, the Mount Diablo course boasts 8,000 feet of elevation change. His fundraising goal is $10,000. The money will support the research efforts of Dr. Sato, the director of the Metastatic Uveal Melanoma Program at Jefferson University in Philadelphia. "I just wanted to do something. I didn't want to sit on the sidelines." 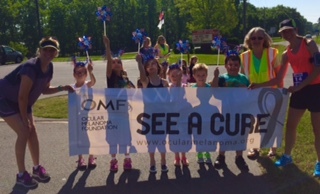 OM Fundraising and awareness is a family affair. 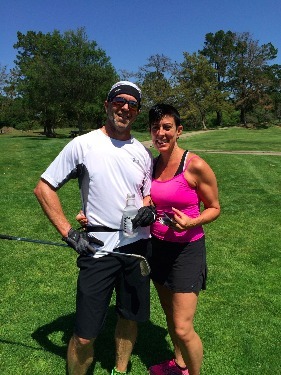 Tim has shared the golf course with his wife, Lori, during his Speedgolf events. And for the 50K, Tim's eight year old son, Shilo, will be joining his support team. "These events help my family come together," Tim said. "They also remind us how fortunate we are, and prove that hard work and effort CAN make a difference." Support Tim's fundraising effort by donating today.